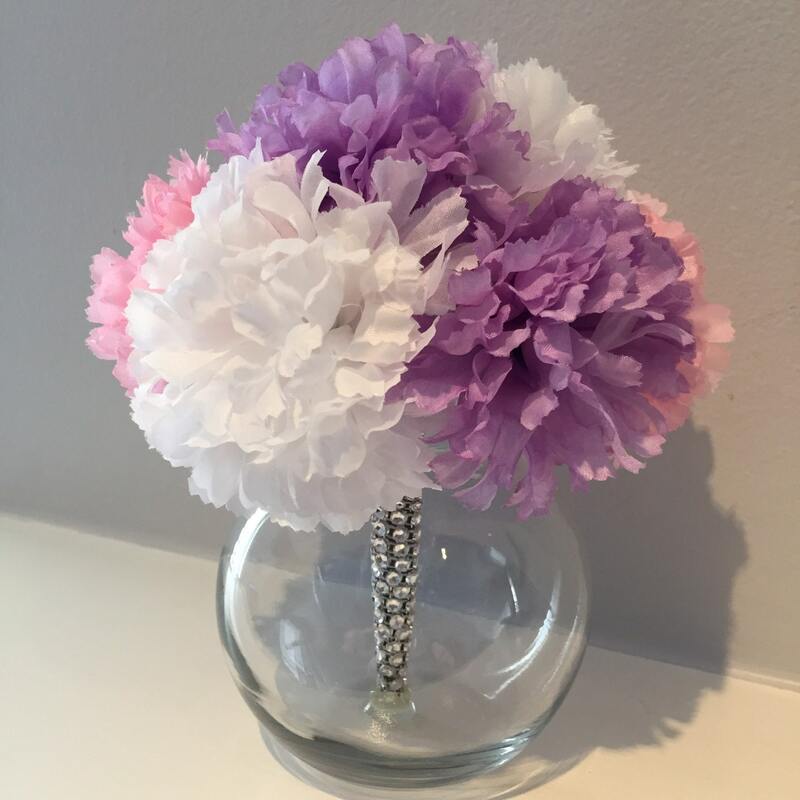 This is a beautiful floral centerpiece perfect for a birthday party, bridal shower, baby shower or First Communion! The bud vase is glass and measures 4"H and 4"W. The arrangement is ~6"H at the highest point of the flowers and ~6"W at the widest point of the flowers. Featured flowers: Carnations. The flower stems will be wrapped with a silver rhinestone ribbon. The bottom of the vases will be filled with acrylic diamond gems (six gems). Each arrangement includes a total of ~8 flowers. If the "Cross Charm/Ribbon" option is selected, the neck of the vase will be wrapped with a ribbon with a silver cross charm. Please let me know if you prefer the gold rhinestone ribbon or silver rhinestone ribbon on the stems (with a matching ribbon around vase neck) in the "Notes to Seller Section". Flowers and leaves types and colors will vary for each order. If there is something specific you would like added or to be customized, please send me a message and we can discuss options. If you are in need of a large order please message me. I offer discounts/free gifts depending on qualifying order size. For large orders, I will purchase the materials once the order is placed. Completion time for large orders will vary pending the order size and supply availability.